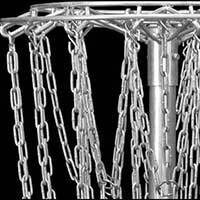 A disc golf basket is the most important component on a disc golf course. Deciding which type of basket to put on a course goes hand-in-hand with the design goals and the type of course being developed. The first disc-catching device was the Disc Pole Hole invented in 1976 by DGA when the company founded the sport of disc golf. Along with developing a formal set of rules, the invention of the Disc Pole Hole was the cornerstone for formalising the game by creating a standard target for the sport. 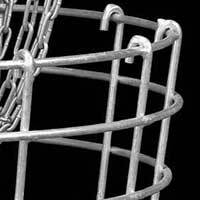 DGA baskets are the most widely used type of targets found on disc golf courses today, and are recognised by the world’s top course designers and players as the best baskets in terms of quality, durability and performance. Baskets are often the largest part of a course’s development budget, and as the Mach baskets are comparable in price to the alternatives out there, the DGA Mach series presents the most cost effective choice for course installations. The “basket” is the most common informal term for the disc catching device, although they are also know as pins, holes, targets, goals, chains, buckets and poles. 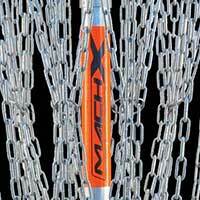 The original DGA Disc Pole Hole set the standard for the sport with a set of basic dimensions, hanging chain and basket design. Contemporary baskets have copied the same basic shape and dimensions but their quality and construction vary widely. Permanent baskets are designed for extended outdoor use and constructed with a durable hot-dipped galvanized finish. They can be portable, lockable or permanent. Lockable baskets can have alternate anchor placements to provide layout flexibility. Permanent baskets are generally installed in one of two ways: direct installation or a more deluxe, movable mounting system. A direct installation has the basket concreted directly in the ground and is permanently fixed. This is desirable for courses that have one basket location and are stationary for added security. The chain holder is the device that the chain is suspended from. 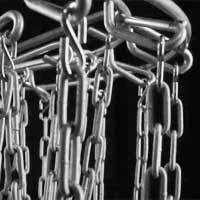 It determines the amount of chain and the configuration of the chain for the basket. Chain holders can be fitted with number plates to add extra visibility. 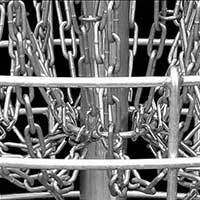 The chain is what stops the momentum of the disc and allows it to drop in the basket. Though most chain configurations seemingly look like a mess of chain, DGA has spent much time and research in determining the best use of this intricate part of the basket. The focal point acts as both a visual marker and a point of focus during putting. The Mach baskets use a larger focal point to enhance both of these two important uses. The Trapper Basket is where the discs comes to rest. A disc must come to rest here for the hole to be complete. The Trapper Basket has been designed to handle the rigorous abuse it can take from constant play and forces of nature. Disc Golf baskets can take a beating by players and Mother Nature. DGA has found that hot-dipped galvanizing is the best deterrent from the harsh effects of weather and was the first to use this process 40 years ago. Many of the original baskets are still in use today.